Nobody — not even the world’s top brands —is immune to negative reviews. We’re not saying it’s the norm, or that you shouldn’t strive for five stars, but do realize that the occasional one-star rating on Yelp or TripAdvisor or a few critical comments on your Google and Facebook pages are not out of the ordinary. Sometimes, bad reviews can even be good for business. The kind of review that can sting and trigger certain feelings, though, is a review that talks negatively about customer service. Customers don’t hold back when they feel like they haven’t been treated well by a business and its service staff. As you can imagine, reviews like this can quickly damage your reputation. It can drive away potential customers. It can even slowly creep up on your team and affect motivation and engagement levels. Whenever customers post an online review of your business, it’s because they’re driven by a desire to engage with you. They want to be heard individually and addressed personally. 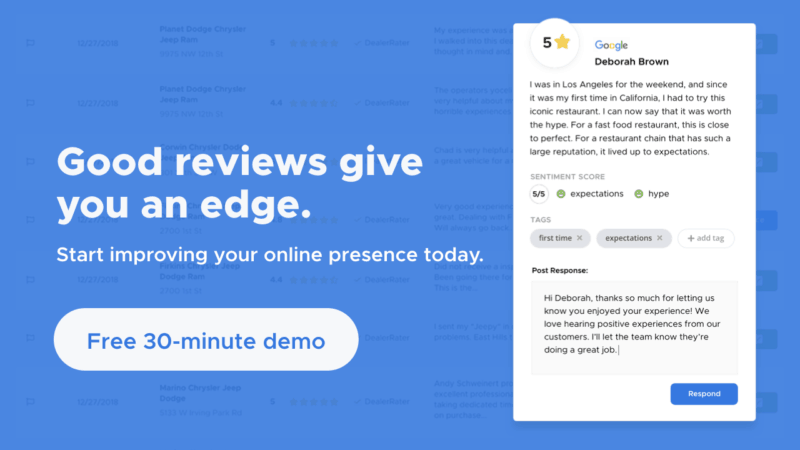 According to ReviewTrackers research, more than 50 percent of customers who have written online reviews expect a response in seven days or less. 1 in 4 have an even shorter time frame: they expect to hear back from the business within three days. So: when customers have something to say about the kind of customer service you have, it’s imperative that you respond. Demonstrate that you care about their feedback. Show them that you’re taking their comments seriously, and that you’re committed to solving the problem of why your service didn’t quite match their expectations. When they hear back from you, perceptions immediately improve. Approximately 80 percent of consumers believe that a business cares more about them when its management responds to their reviews. This explains why the most highly-rated businesses on online review sites are typically the ones that are most responsive to customers. They’re also usually the ones that can more easily build goodwill, inspire customer loyalty, and convert critics into fans. If a customer has written a negative review about your customer service and you’re trying to write your review response, it’s best to avoid cookie-cutter phrases and sentences that don’t really resolve or address specific issues raised in the review. We all know that “apologies for the inconvenience” isn’t really an apology for the actual customer service issue. When you respond, address the customer by their name (unless the review is anonymous). Evaluate the situation and be as specific as you can about their service experience. Explain in detail how or why service-related problems arose, without sounding like you’re making excuses. And communicate any changes or improvements you have made (or will be making) as a result of their review. Imagine if you reviewed a 5-star hotel or Michelin-starred restaurant and got a response from the business owner, the general manager, the superstar chef? Regardless of how you rated the business, you’ll probably feel flattered that the “boss” took the time to read and respond to your feedback. That’s why it’s good to get your leaders involved in the review response process. What better way for them to show that customer service and happiness are their first priority? When the response comes straight from them, it can have a very real and measurable effect on converting critics into fans and casual browsers into potential customers. Negative comments about your customer service may or may not be valid. Either way, when you respond to the review, ask for a second chance. This is the key to retaining even unhappy customers. And if they do come back for a second visit, be sure to encourage them to update their review if the latest experience yielded a better customer service experience. Sometimes, there’s a metaphorical fly in your soup that you likely wouldn’t have known about if not for the negative review. In this case, you have to discuss the review with your customer service manager as well as the people who deal directly with your customers on a daily basis: your frontline employees. Ask what happened. Talk about how you can fix the issue. Communicate with them and empower them to learn (and then move on) from specific customer service mistakes. Show your team that you’re taking customer feedback seriously, and that they should, too. At the same time, focus on tone and voice and keep your talks with the frontline team positive and encouraging. Leverage the conversation to boost instead of hurt morale. Explain that you’re using these critical reviews to set them and your business up for success.